When I was a little girl I spent most summers at my Gran's house. It was during this time that I first heard her say "I'm not sure what to buy me for my birthday this year." I didn't get it then, but I do now. I have a wonderful family and each year when my birthday rolls around they shower me with gifts and confetti cupcakes. They always want to know what is on my birthday wishlist a couple of weeks beforehand. Now, I know they would buy me anything I ask for, but there are some things I just can't ask my dear family to buy - like a cotton candy machine. Impractical? Yes. Frivolous, guilty pleasure? Yes. A lot of fun? Heck yes! The machine I'd had my eye on was a table-top variety for thirty-some-odd dollars; well within the gift-to-self budget. It was in an online shopping cart for two weeks before I pulled the trigger, cabinet space be darned. I've been practicing my candy floss spinning once a week for the past month, and I knew it wouldn't be long before the fluffy stuff made an appearance in my baking. That's how this cake came about, but you don't need your own cotton candy machine to make it. and a few bags of commercially spun cotton candy. You'll also need to use a heavy-duty stand mixer and an extra large mixing bowl. This recipe is for a tiered cake (wedding-type), so it is very dense and makes a large quantity of batter. As far as the cake's flavor goes, it tastes much like a moist butter cake with an extra-large vanilla punch. Note: Use 3 graduated leak-proof spring-form pans in sizes 5",7" and 9". 1. Preheat oven to 325 degrees. Grease pans and line bottom and sides with parchment paper. 2. Sift cake flour, baking powder and salt together in a large bowl, set aside. 3. Cream butter, cotton candy granules and granulated sugar together in the bowl of a heavy-duty stand mixer fitted with whisk attachment. Beat until fluffy. 4. In a separate bowl, beat the egg whites with an electric hand mixer until stiff peaks form. Do not over-mix. Beaten egg whites should not be dry. 5. With stand mixer on low speed, mix in flour mixture and milk in alternately until a very thick (almost cookie dough-like) batter forms. 6. Beat in vanilla and butter extracts. 7. Using a sturdy rubber spatula, fold 1/2 of the stiff batter into the egg whites. This will take a while to combine, but the batter will loosen eventually -I promise! Fold in the remaining batter until thoroughly combined. Batter will be thick. Your arms will be tired. 8. Divide batter evenly among trio of pans, beginning with the 5" pan, which will hold about 1 1/2 cups of batter, then the 7" pan, which will hold 2 1/2-3 cups of batter, and then pour the remaining batter into the large 9" pan. 9. Bake 5 and 7-inch cake for about 40 minutes, or until a toothpick tester comes out clean. The largest cake may take up to 1 hour - 1 hour 10 minutes to bake. 10. Let cakes cool slightly in pans before removing the spring-form rings and removing them from the pan base. 11. When completely cool, level cakes with a cake leveler or serrated knife. Note: Do not skip this step! It is integral to the cake's flavor and moistness. 1. Combine water and sugar in a small saucepan over medium heat. Cook until granulated sugar has dissolved. 2. Remove from heat and stir in extracts. Cool slightly before using. You can use this syrup warm or at room temperature. 3. Brush cooled cakes liberally with syrup. Use all of the liquid syrup - in other words - baste these cakes like a thanksgiving turkey! You don't have to do this all at once, you can brush the cakes and let the syrup soak in for 10-20 minutes, and then come back and intermittently brush cakes until all syrup has been absorbed. 4. Let cakes stand lightly covered with aluminum foil at room temperature for several hours until syrup has been fully absorbed. In a stand mixer fitted with the whisk attachment, mix together the butter and confectioners sugar. Begin mixing on low speed until crumbly, and then increase to high and beat for 3 minutes. Add vanilla extract and beat again for another minute until light and fluffy. 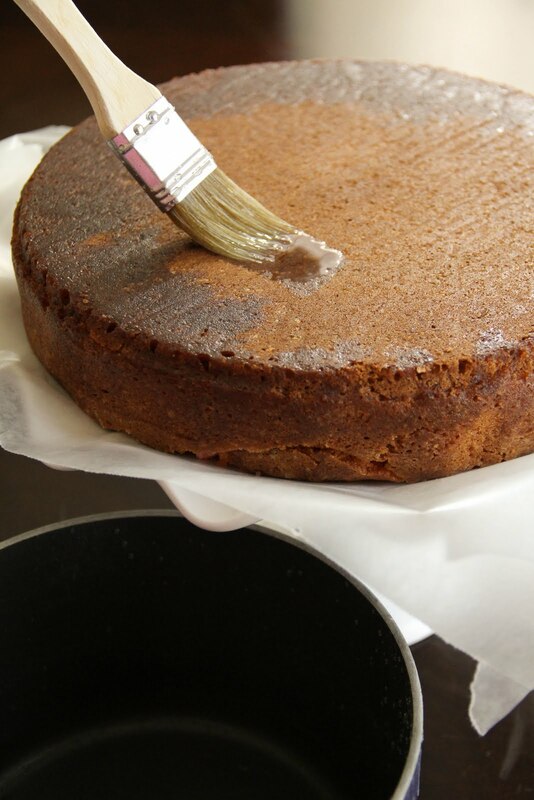 Using an offset spatula crumb-coat the cakes and let set at room temperature until frosting crusts. 1. Dust work surface with confectioners' sugar. 2. Using a smooth rolling pin, roll fondant to 1/4" thin. 3. Drape fondant over the largest cake and gently fit and smooth it over the edges Trim cake with a small paring knife or pizza cutter (recommended!). Re-roll fondant scraps and repeat with the remaining cakes. Don't pull fondant downward onto cake. If you need a tutorial on applying fondant, you can find a useful one here. 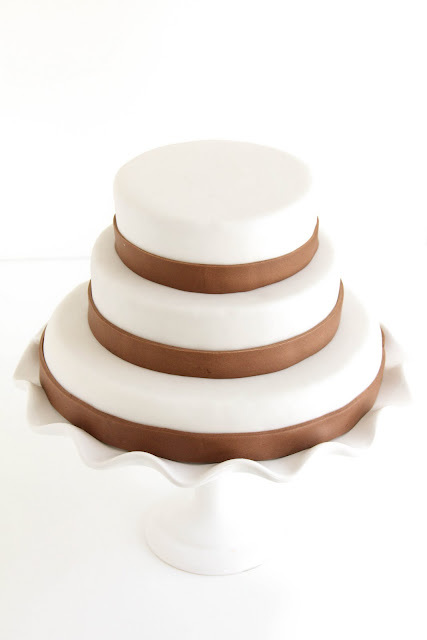 Stack cakes on a cake stand -graduating with the largest tier as the base, graduating up to the smallest tier. 4. Roll chocolate fondant into a long piece, 1/4" thick. Measure around the sides of the cakes and cut three 1-inch wide long chocolate fondant ribbons to fit. You may have to cut one or two ribbons, then re-roll scraps and cut the third piece. 5. Pour a little corn syrup into a condiment cup. Using the artist's brush, dab the backs of the chocolate ribbons with a little corn syrup. Apply the corn-syrup-sticky side of the ribbons to the bottom edges of the cakes. Press to adhere. Note: Wait until just before serving the cake to decorate. 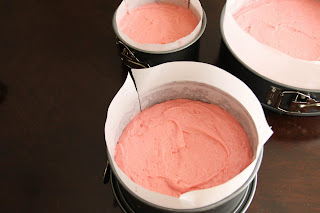 Don't open the cotton candy tubs/bags until you're absolutely ready to apply it to the cake. As you know, cotton candy will wilt over time. 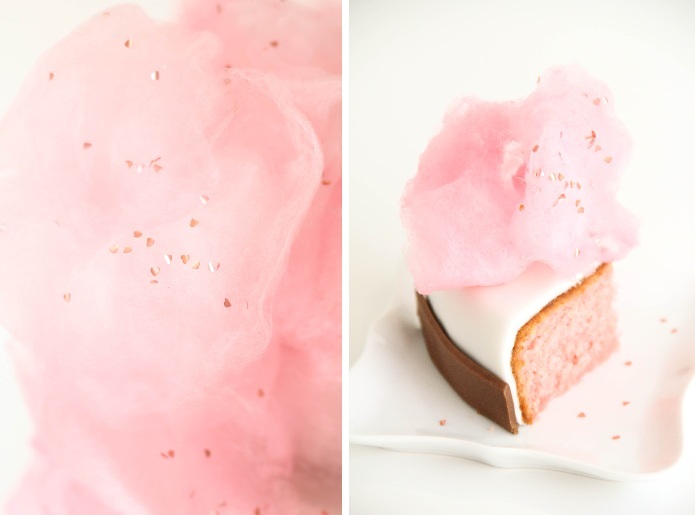 Alternatively, you may choose to serve puffs of cotton candy atop slices of cake. 1. 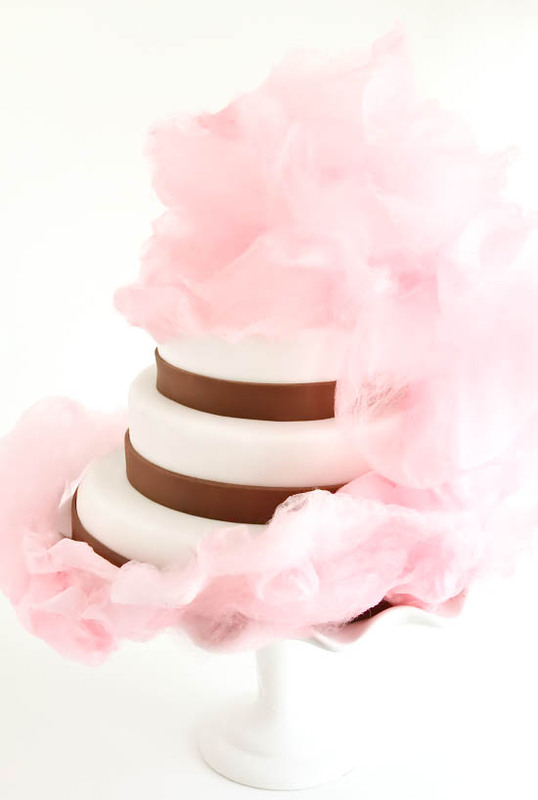 Tear cotton candy into fluffy pieces and drape over top of cake. Continue to apply cotton candy down the side of the cake, allowing the cotton candy pieces to adhere to one another. 2. 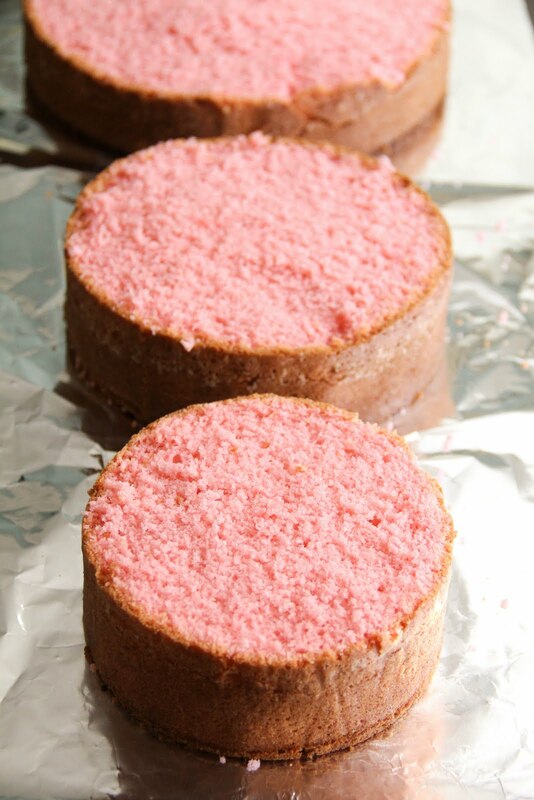 Apply cotton candy pieces around the bottom of the cake stand and around the back of the cake. Apply as much or as little of cotton candy as you'd like. My dear friend, this is stunning. I wish you could have made this for my birthday when I was 7 years old. But really... I just wish you could make it for my birthday next month. WOW! You are so talented, it's incredible. How sweet, sweet, sweet! This cake could span so many different age groups. I could see it being so dreamy for a little girl, a teen and a bride too. Who does't just love cotton candy? How fun. And... Happy Birthday! Beautiful! What's on your birthday wish list for next year? WOW!! This is so cool and dreamy and beautiful!! Love Love Love this!!! This cake is so amazing! I love how whimsical it is! SOOOOOO pretty. Every little girls dream cake! 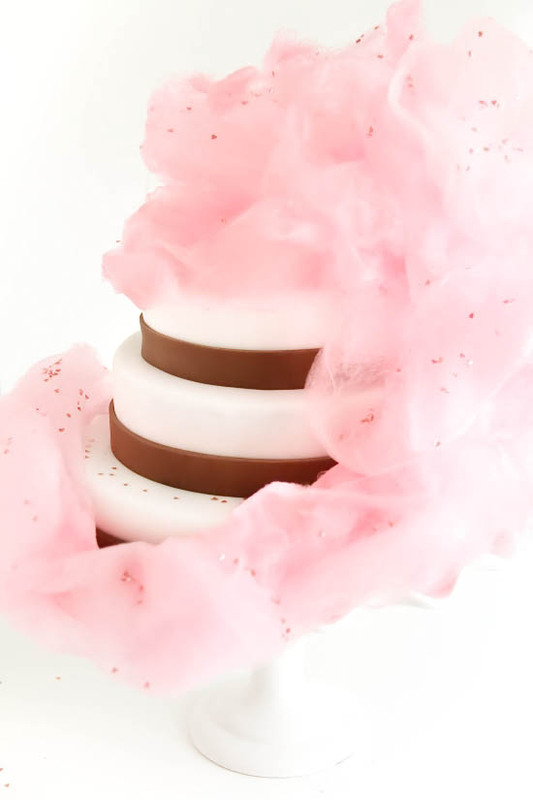 Love the use of cotton candy on the outside! Heather, I LOOOOVE this!! So so pretty. It's probably my favorite cake I've even SEEN!! Fantastic! This cake is so cool. I've always eyed those cotton candy machines too. Lovely! WOW! This would make such an amazing wedding cake! Guilty Pleasure & Food Lust. What a combination ! This is utterly gorgeous -- I'm in awe of your cake-making and -decorating abilities!! What a dreamy looking cake! Almost looks too good to eat...almost! This is truly amazing. 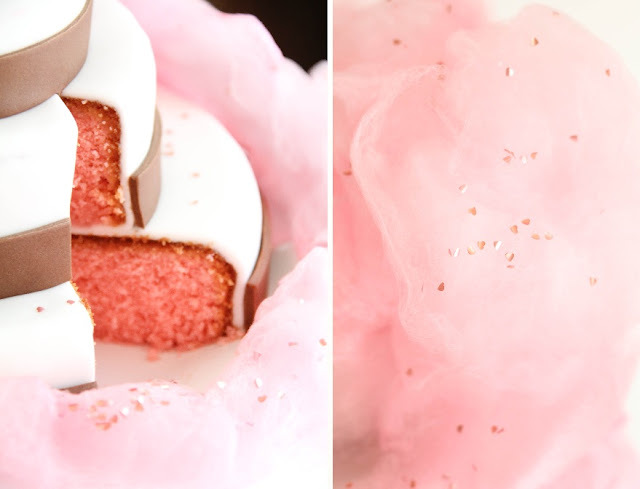 I adore the light, airyness of the cake...not to mention the pink looks like a glorious cotton candy cloud! Heather, This cake makes me happy! It's sophisticated and fun at the same time, and oh so PINK! You sure have the cotton-candy making perfected. We must be on the same wave length because I have some cotton candy cookies waiting in the wings, but they look pretty pathetic in comparison~lol! This cake totally just made me go "EEEEEEEEEEEEEE!" in a very loud, very high pitched voice. Then every dog in the neighborhood started barking like I was on one of those dogs-only frequencies. Not good. The "EEEEE" part, that is...the cake is brilliant! That cotton candy cloud wrapping up around the snow white cake tiers is just gorgeous...and so happy! I love it...and the pretty pink cake inside! Just lovely! WOW....love the cake!! Happy Birthday to you!! woaaahhhhhhh...i dont know quite what to say! the words unique, incredible, DIVINE! come to mind, but apart from that pretty darn speechless. you are a genius! Hi Angela - I've only had this machine for a month, so I can't really say much about its longevity; however, it has performed beautifully so far! 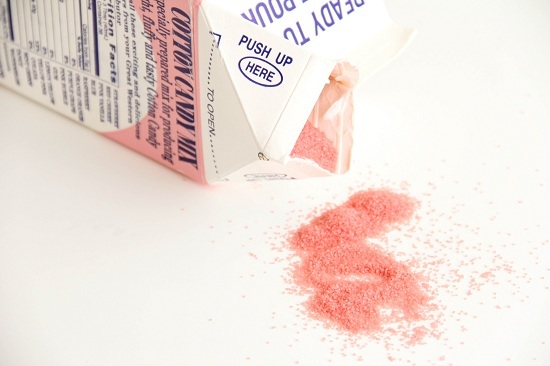 Also - something else I haven't tried yet: you are supposed to be able to pour crushed hard candy into the spinner to make whatever flavor cotton candy you like. I think I'll try crushed coffee nips first. I bought this one because the price and reviews were so good. Lots of helpful tips in the reviews too. I think I may need to use it for a few more months before I fully endorse it... but so far, so good! I kinda hate you, but love you all at the same time! So very girly and cute! Heather, go you! It is always best to pick out our own out of this world Birthday presents. How fabulous, pink & fun is this cake? Adorable idea. I am so in awe of this cake - it's absolutely pinkalicious! this is absolutely gorgeous! beautiful! My FBLA teacher has a cotton candy machine and sells it to us kids (on the sly because the stupid distric is squeezing the "junk food" out of our lives)for $2. I think it would be super rad to have a cotton candy machine! If anyone deserves a cotton candy machine it's you. What a beautiful cake. Fluffy gorgeousness! You blow my mind! This cake is one of the most beautiful baked creations that I've ever seen. Stunning! what a gorgeous cake!! I would love to make this for a wedding or or baby shower which ever, it's just beautiful. I never baked anything this heavenly when I was a culinary school student (I wrote about it here, if you're interested: "Culinary School: Three Semesters of Life, Learning, and Loss of Blood," on Amazon Kindle - http://amzn.to/oqXw1R), but this is so gorgeous, I wish I had! Wow. Just, wow. It looks like a dream. I love that you bought a cotton candy maker. That is incredible. You don't need me to tell you this, but this is a GORGEOUS cake. I love that brides are using clever ideas for their weddings, but I've never seen such a fun idea made so elegantly! I love the birthday gift to yourself! I've seen those machines and wondered if it would sit on the shelf forever if I bought one. Good Grief!! You are AMAZING!! This will be my virtual birthday cake next week! I really enjoy this blog & it inspires me to make more creative desserts...thanks!! I literally saw this picture mouthing "OH MY Godddd" - you've got some major talent!! I want to have a little girl and make her beautiful cakes like this every year. that color pink is just fabulous isn't it? i will easily take this cake for my bday in a couple weeks. we NEED to open up your own shop you know? you're so talented .. so beautiful ..
Looks like a little girl's dream cake! Every single post is better than the previous, and you never cease to amaze me! Thank you for sharing such a beautiful creation. I WANT this at my wedding! I've seen cascading sugar flowers on wedding cakes, but cotton candy? whoa! Has anyone tried this recipe yet? Is it as good as it looks?? Is it possible to not do fondant? What kind of icing would you use? I'd suggest Swiss buttercream. It goes on really smooth and tastes yummy without being overly sweet. Has anyone actually made this recipe? I would like some reviews from actual bakers.